Men have historically always worn something at the neck – if it wasn’t a tie, it was an ascot or a workman’s neckerchief. Such things are practical, for work and for warmth. Over the past six months we have been working with weavers Begg & Co on our own, modern equivalent. The result is a square scarf in ultra-lightweight cashmere, beautifully soft and luxurious, that is designed to be tied and tucked into a crewneck sweater. 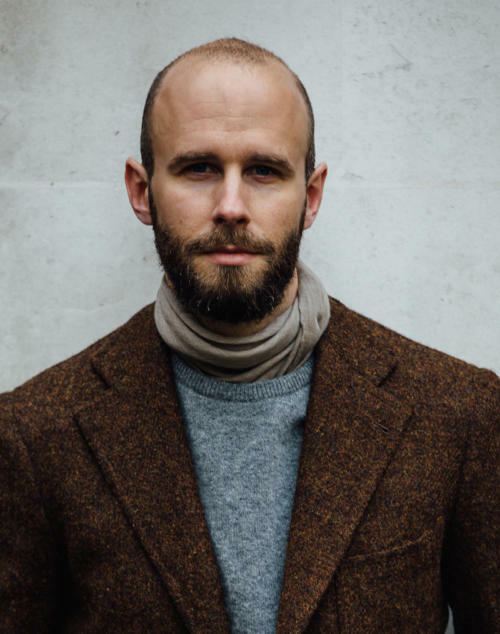 I’ve been wearing mine regularly for the past 4 weeks, and I find it particularly nice during these transitional months – Autumn and Spring – when a big, long scarf often feels cumbersome, but having something against the neck is great to keep out the morning chill. We made our square scarf in two colours, navy and natural. These go with a whole range of colours of knitwear, just some of which are shown here. Navy is subtle and chic with navy itself, but also works with darker colours like charcoal. 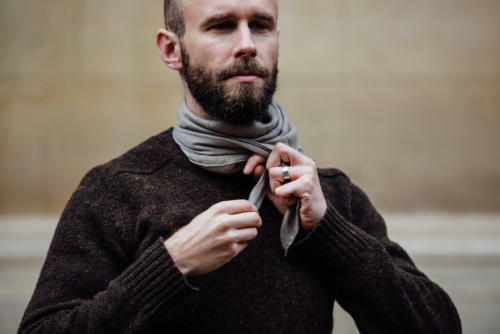 The ‘natural’ shade, on the other hand, is a great compliment to autumnal colours like rust, brown and green – as in the shetland sweater at the top, and tweed jacket below – as well as flannel grey. If one thing sets our squares apart, however, it is the Wispy cashmere they are made of. Begg developed this style of scarf with an ultra-fine white cashmere. It’s so fine that it would normally snap under the tension of a loom, but Begg use a patented coating on the cashmere to allow it to be woven, and then wash the coating out afterwards. The scarves are woven in Begg’s Scottish factory, on the west coast in Ayr. 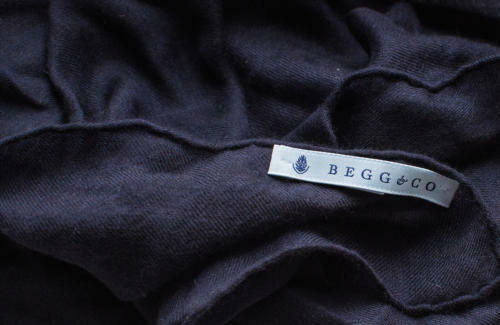 Begg has been the premier scarf manufacturer in the country for decades, but until recently only made for other brands (including some of the biggest designer houses). This collaboration is another stage in its emergence as the best weaver of fine scarves in the world. You can read more on our visit to the Begg factory here. We also decided to give the scarves hand-rolled edges, like a good handkerchief. Of course, hand rolling the edges adds considerably to the time of production and cost of the product. 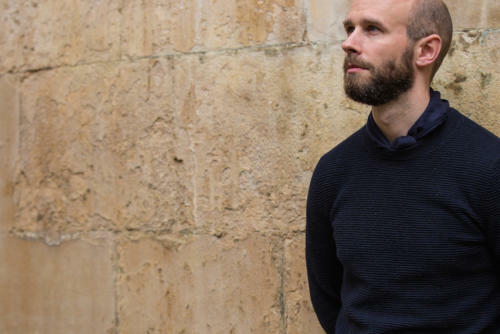 But we wanted to produce the absolute finest piece we could – and the wispy cashmere deserves it. The square scarf is designed to be folded along its diagonal, creating a triangle, and then tied around the neck. The great thing about folding this way is that the point extends down the back, preventing the scarf from riding up and exposing skin between scarf and sweater. At the front, the scarf can be tied simply over-and-under (like an ascot), in a square knot, or left to hang loose. It can even be tied in a four-in-hand, like a tie. I’ll post more on ways to wear it later in the week, but personally I prefer a simple over-and-under (shown in all images above). It is also nice to wrap the scarf around twice (as shown below) and secure it with a small knot. This creates a thicker band of cashmere, and is considerably warmer. We have an initial 50 scarves available in each colour. After that they will be sold out, pending a second run next year. Scarves are £175 each. They can be purchased through a special page of the Begg website here. There is free shipping worldwide. Begg will be handling all payments and shipment. Their terms and conditions, as noted on the site, apply. If you’d like to read more about the development of the wispy cloth, Begg have a nice article on their site. You can follow the discussion on Introducing: the PS square scarf by entering your email address in the box below. You will then receive an email every time a new comment is added. These will also contain a link to a page where you can stop the alerts, and remove all of your related data from the site. On point as ever Simon, classic with modern twist. Also where is the shetland crew neck that you are wearing in the first shot from? A&S? Thanks Colin, pleased you appreciate the design aspects. Yes, A&S. I’ll post more on the clothing from the photos at a later point. 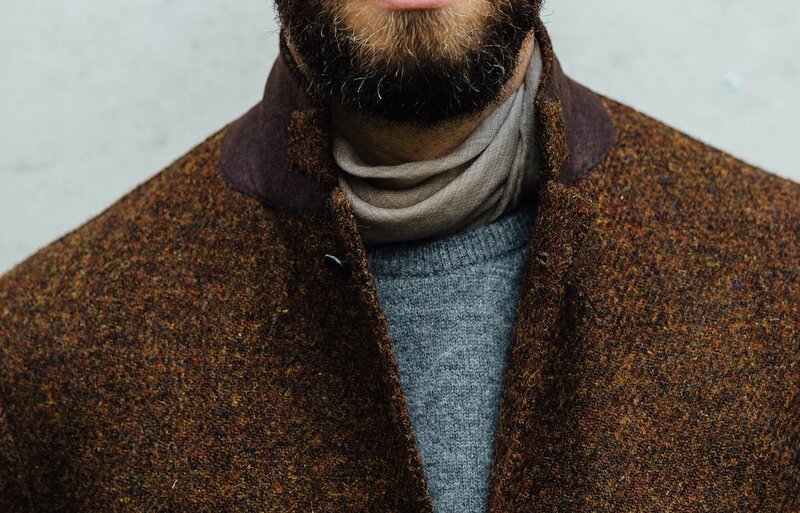 Not overly keen on the scarves – shades of old man Steptoe – but love that tweed jacket. What cloth is it and where can I get some? Thanks. 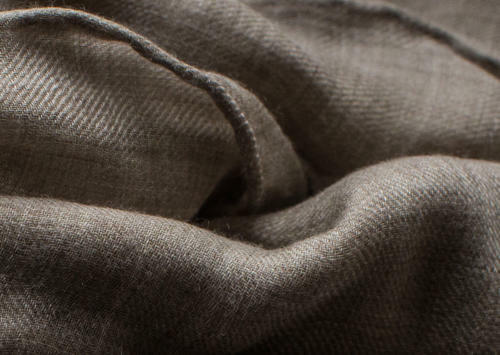 The standard wispy is an amazing fabric, so thin you would never believe it is cashmere. This is a perfect piece for it. They look much more textured and interesting than the normal fine wispy scarves. Or is this just the camera zoom? I am a long time reader but only recently capable (financially) of spending money on the kind of clothing and accessories featured here. I recently bought a couple of beautiful Emanuele Maffeis shirts (as have featured on this website). The shoulder is very, very pleated, and I am struggling to find a good source on the internet explaining to me in (relatively) simple language the need for this spalla camicia on my shirt and the nature of this tradition. I sort of understand that the sleeve on the shoulder side is larger than the armhole, but why? And why have (certain) Italians chosen to pleat it heavily on the top side and have it straight all over, instead of doing what every other shirtmaker does and pleat it subtly along the entire length? Would really appreciate an answer to this to further my personal development on the subject. Love the website! Always nice if these questions are on related posts – eg shirt ones. Happy to answer this here though. The sleevehead is always larger than the armhole, to give greater movement. Italians tend to have a greater difference, but the biggest reason that all the folds are on the top of the sleeve is simply that the makers decide to put the fullness there, rather than anywhere else. If you don’t like it then you simply don’t like the style I’m afraid. A bespoke maker can often do it either way. It can look a little effeminate, but I like it in moderation. Rather like the roping on a jacket’s sleeve, it adds visual breadth to the shoulders by giving the viewer a focus point. Apologies! But thanks for the rapid response. I like it too (in moderation, as you say. I don’t need to look like a Swiss Guardsman) but I just wondered why it was so pronounced. Now I know. Ordered the Natural I think the lighter shade is preferable and would look better with a navy crew neck…..sorry, Simon. Looking forward to seeing more ways to wear it. No problem Colin, natural is definitely the most versatile and will work with loads of colours. navy is a bit more conservative and ‘hidden’, perhaps for guys who are more nervous about wearing it. Thanks for answering Mart’s question I finally understand. I’ve heard it explain before but not as well. The dimensional aspects of tailoring is something that fascinates me and deserves more photography to demonstrate. I instantly thought of a roman soldier. Most depicitions of them have a scarf just above the armour. would’t you say that the navy one will work with flannel grey? Jason King is alive and well and living in London. Great look and one that I have been promoting for a while. I am quite fixated on these scarves, Simon. Can they be folded and tied in such a way that they would fit under the collar of a shirt (similar to an ascot) or are they better suited to the bare, crewneck look? Beautiful design Simon, a very versatile addition to any wardrobe. 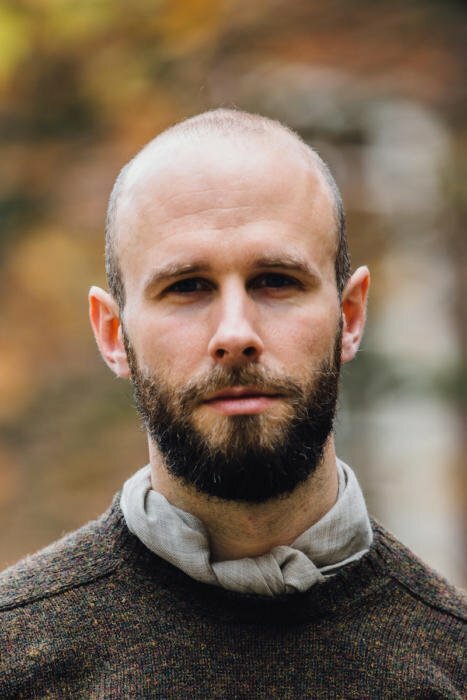 In warmer summer weather, aside from, perhaps, a lighter linen scarf, how does one soften the open shirt/jacket lapel disharmony that, in winter, a scarf/kintwear layer can tone down? Do you wear a t-shirt under the sweater? Personally I think it looks nicer for a t-shirt not to pop out at the neck but on the other hand you need to wear something underneath. Any thoughts? P.s. I think the website is wonderful and check it everyday. Cheers Anmar. Yes, I wear a T-shirt underneath. You wouldn’t want shetland wool like that against the skin all over! Do you plan a repeat run of these? Perhaps with an extended range of colours. Silver grey would be nice as would some heritage polka dot. I’ve never seen these before. Here in Chicago it’s bone-chilling cold from early November to mid-May. Interesting concept. But I do balk at the price. Having said that, I see their practicality in less formal scenarios.